The Ohio State University Department of Design is dedicated to purposeful, systematic, and creative activity. Designers give form to products, spaces,and messages. Their designs involve the analysis of problems; the transformation of findings into solutions; and the expertise to devise compelling visual forms and to advance applications of new technologies in our lives. We define design as a purposeful, systematics and creative activity. The process is purposeful — designers give form to products, spaces and messages, and satisfy the functional, psychological and aesthetic needs of users. The Department maintains studio teaching spaces, laboratories, and offices in its space in the historic Hayes Hall. Students and faculty also extensively use the resources of the Advanced Computing Center for the Arts and Design (ACCAD), which provides sophisticated means to further study computer graphics, animation, and virtual product and spatial simulations. of mutual respect and engagement between the design disciplines, and there are very few design programs in the nation who house all three of these disciplines under the same roof. 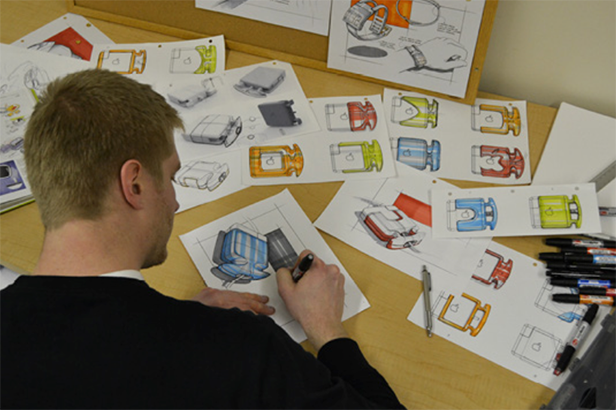 Industrial Design deals with developing a wide variety of objects and interrelated systems. Consumer electronics, tools, safety equipment, furniture, medical equipment, and transportation devices are just a few of the many products created in practice. Interior Design includes the planning of spaces for commercial, industrial, and institutional uses. Offices, retail spaces, health-care facilities, and trade-show exhibitions are among the many types of projects typically created in the field. Visual Communication Design involves the creation of various types of printed, fabricated, and digital media. Corporate identification, environmental graphic, consumer packaging, motion graphic, and interactive information systems represent some of the many possibilities in this discipline. A team that included students and alumni from the Department of Design has won first place in the Undergraduate Track of the Fisher College of Business 2014 Business Plan Competition. The competition, which seeks to stimulate and nourish the entrepreneurial spirit, includes conceptual rounds, a business plan portion, and a presentation to a panel of judges of entrepreneurs, venture capitalists, private investors and faculty. Their Juiceboxx project is a protective case for a MacBook charger that features a clean, simple aesthetic with a unique design that guides the cord into exiting the power supply with a gentle curve, significantly reducing areas of high-stress. In Spring 2013, two teams of second-year industrial design students designed and assembled two 3D printers. The students had the opportunity to build the printers through the Department of Design, in an industrial design class taught by Professor Roozbeh Valamanesh. The teams spent nearly two months in class researching, designing, building and modifying the printers to function properly. “The coolest thing was when it started working,” said student Emily Stokes. The interesting thing about these printers is their “self- replicating” nature according to Valamanesh. The two printers created this year will be used to create the parts needed to construct printers next year, and so on, creating a network of printers. The 3D printing project was made possible by funding from the Advanced Computing Center for the Arts and Design (ACCAD); Valamanesh hopes to continue the project every year.